We offer friendly, thoughtful hospitality and embrace the principles of eco-tourism. 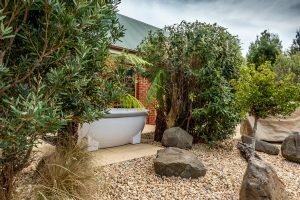 Tin Dragon Cottages is an eco friendly spa retreat set on a private 36 Acre estate on the the Ringarooma River in Branxholm, Tasmania, 75 minutes from Launceston and just 8 minutes from Derby. Surrounded by the river, rolling green pastures and a backdrop of native bush, this luxury eco retreat offers peace and privacy, seclusion and space. Here is your place to unwind, recharge and reconnect with nature. 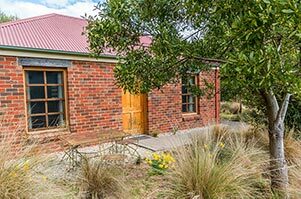 Tin Dragon Cottages offers luxury farm-stay accommodation, with five cottages overlooking the river and the Settlers Hut set in native bush. Each accommodation choice has a private native garden and bar-be-que area, full kitchen and laundry facility. Studio cottages have private outdoor heated spas. Cottages have cosy gas fires for warmth in winter. 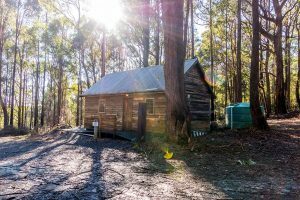 Enjoy the sounds of the bush, tranquillity of the river, beautiful Tasmanian sunsets in your very own private retreat near Derby in north east Tasmania. Overlooking the river, this two-bedroom cottage with disabled access is suitable for two couples. Overlooking the river, this two-bedroom family cottage has two single beds in the second bedroom. Overlooking the river, this studio cottage with private outdoor heated spa is suitable for a couple. Overlooking the river, this studio cottage with private outdoor heated spa is suitable for one couple. 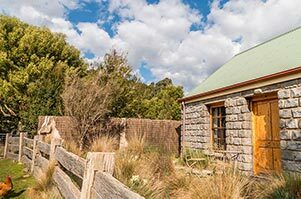 Set in native bush this hut accommodates up to four persons. From AU$100 per night for one person. Very cosy well laid out cottages, fresh farm eggs in the fridge, and have everything you need to relax and let all your stress and worries run down the beautiful creek. We hope to return and do it all again. It is a long story how we came to embark on this search for Guan Di in Tasmania. Our preparations for accommodation for our trip led us to these cottages. The TDT Cottages are a great place to stay, they are the best that we have stayed in by far. The hosts Grahame & Christine are wonderful hosts and very informative if you want to know anything about the area. Guan Di led us on a magical trip. We found him. My wife and I had the extreme privilege of being Christine and Graham's first ever guests way back in 2008. And we loved it. At last the opportunity presented itself for a return visit. And we loved it. 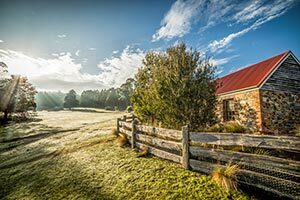 The cottages nestle in a loop of the gorgeous Ringarooma River at Branxholm in Tassie's north east. Tin Dragon Cottages is your central location for adventuring further into nature. Booking your dream escape with Tin Dragon Cottages is really fast and safe. Just set check-in and check-out dates, view the description, choose your cottage and fine-food extras, provide details for reservation and pay online! Your perfect holiday is several clicks away!